I have wanted a backup camera for my MINI Cooper for years but haven’t made the effort to install one because of the wiring that’s involved. I kept thinking that someone would come up with a wireless version that could interface with my smartphone. I’m happy to say that my wait is over. Well almost… Dozens of former Apple employees have teamed up to create RearVision which has 2 HD wide angle backup cameras that are built into a frame that you install over your license plate. The frame even has solar panels that power the cameras so no wiring is needed. There’s a small adapter that plugs into the OBD port of your car and the RearVision pairs via Bluetooth to your iOS or Android smartphone to provide a live view when you’re backing up and audible alerts when objects block your path. 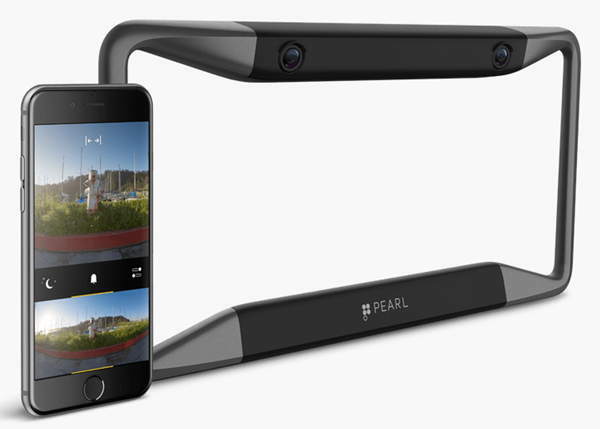 The Pearl RearVision camera is now available for pre-order for $499.99 with shipping estimated for September 2016. For more info visit pearlauto.com. Years ago, I wired up a rear view camera with an integrated monitor in the mirror. It’s still the best aftermarket purchase I’ve made for my car. I think anyone who can change a screen on a phone can tackle a project like this, and there are plenty of car forums that can coach you through the process. From what I recall, the most difficult procedures were drilling some holes through the sheetmetal and pigtailing the electronics to access power and car’s reverse “signal”. However, its a far more elegant in integration and convenience in the end. No, I’ve not tried it because it’s not available yet. This is just a news post announcing a new product. I hope to be able to try it though. Someone needs to design the equivalent of a USB hub for OBD ports, for those of us who already have a device occupying ours (an Automatic dongle in my case)! I installed a wireless backup camera from Garmin on my car. It uses a Garmin GPS unit as the monitor. 1. There is a video lag of maybe 500ms which may not seem like much, but I’ve often had cars suddenly appear from my left or right when I’m pulling out of a parking lot to the point that I cannot trust the video as much as I do on my wife’s car which is hardwired with no noticeable lag. 2. The video quality is not the greatest – my guess is compressing video using low powered devices to broadcast over a low bandwidth channel is responsible for that. 3. There is still significant effort involved in wiring up the rear view camera to the license plate, hacking into the existing car wiring to draw power and sense the reverse light. The extra effort to pull a video cable from the trunk to the dash looks minimal in comparison. 4. Now the unit on the dash needs power as well so you need to use up the 12V adapter in the front or hack into the wiring/fuse box under the dash. Probably much easier and better to go with a wired unit. I recently installed the Pearl RearVision on my 2012 Mini Cooper S. The whole installation and setup process was a breeze, but I noticed I was unable to reach/press the rubber button on the rear hatch to open it when everything’s installed. The top of the RearVision frame is too thick and blocks my finger from being able to depress the button. The only work around for now is to take off the camera frame to open the hatchback. Let me know if you guys have an easier work-around for this issue.